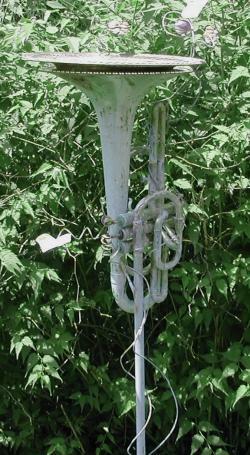 These birdfeeders are made from old, unrepairable band instruments. They are the perfect for your musician friend. The instruments are mounted on copper pipe with copper vines and leaves. A green verdigris is added to the copper and the instrument. When shipped the posts are split in half with a coupler added to assemble the sections. 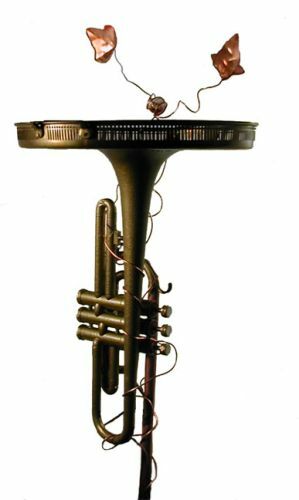 On top of the instrument is a recycled silver, copper, brass, tray or bowl. More shallow trays are best suited for birdfeeders while deeper bowls can be used as birdbaths, plant holders, etc. It is possible to turn your old, unplayable intrument into one of these creations. Contact Gordon for information. The availablilty of insturment birdfeeders is dependant on the instruments that I can obtain. If you know of a band director that might have old instruments avaible to sell, please contact me. Instrument birdfeeders are $87 + shipping/handling ranges from $25 to $40. They are best suited for delivery, pickup in Wellington, or at a show.